The term ‘big price move’ is used too liberally in relation to energy markets which have a relatively high level of ambient volatility. But last week’s decline in the Brent crude curve was a big move by any standards. This decline in Brent will have profound repercussions for an already weakening LNG market. And these will feed through into European gas and power markets in 2015. OPEC’s Saudi led Middle Eastern producer block has thrown down the gauntlet to non-cartel producers. By maintaining production targets and implicitly accepting associated price declines they have initiated a battle for market share with both the US and Russia. As a result the front month Brent contract crashed through 70 $/bbl on Friday. And more importantly, the front 3 years of the Brent curve has re-rated towards $80/bbl. 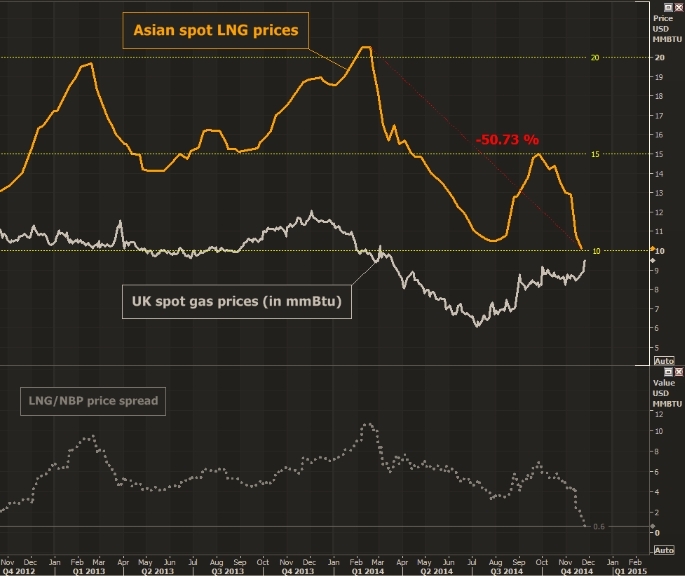 The move lower in Brent will act to drag down long term LNG & European gas contract prices with several months lag. This increases the chances of a substantial decline in European gas hub prices in 2015. It also opens up the potential for a return to supply glut conditions (similar to 2009-10). In this environment of ‘tectonic’ movements in energy prices, market interconnectivity plays an increasingly important role. European gas hubs may play an important role in stemming the declines in spot LNG prices. In turn European power markets may act to provide key support for European gas hub prices. Last week we looked at some of the drivers of this renewed slump in LNG spot prices. The lead up to the last few Christmas periods has become associated with robust demand and rising prices. But this year Asian buyers have ample supply, storages are full and portfolio players are long LNG. As a result spot prices have crashed back to pre-Fukushima levels. The volume of LNG import flow into Europe (both spot cargoes and contracted European supply which cannot be economically diverted). The price of incremental LNG import volumes if there are supply issues in Europe over the winter (e.g. Russian interruptions or major infrastructure outages). But it also may have important implications for European power markets. An increased flow of LNG imports will put downwards pressure on hub European hub prices. As Q1 develops, storage withdrawals are likely to add to that price pressure. This could precipitate a Q1 slump in European gas hub prices. As Asian spot prices declined into summer 2014 reducing the premium over NBP, LNG imports into Europe increased, acting to drive down hub prices. A pickup in power sector demand (given weaker hub prices) provided some important support for NBP gas prices across this period. Gas hub prices fell to a level where CCGTs started to displace coal-fired generation capacity in the merit order. The UK is Europe’s canary in the coal mine here, given the dominance of gas-fired capacity in the supply stack. But this effect may become wider spread across European power markets in 2015 if gas hub prices are really under pressure from oversupply. If a similar or more significant hub price decline plays out in 2015, hub prices may again need to fall to a level where CCGTs are displacing coal in European merit orders. So the variable cost competitiveness of newer CCGTs vs older coal stations may become a very important dynamic to watch in 2015. The UK is a key market to watch but this is relevant for gas fired generation in Continental markets as well (e.g. Netherlands, France, Spain). Gas price declines may be good news for beleaguered CCGT owners, through acting to increase plant load factors and generation margins, particularly in the UK where the carbon price floor increases gas plant competitiveness. We will come back and have a look at this dynamic in early 2015 when we have a clearer view of the winter supply/demand balance. In the meantime it may be worth keeping an eye on the LNG spot vs NBP price differential as a useful indicator of things to come.